Johnnie Walker is one of the biggest names in Scotch whisky, and they have an impressive portfolio of bottlings widely available that any Scotch lover will enjoy. The range is expansive, beginning with an affordable selection of whisky worthy of any cocktail and leading up to bottles that are pure luxury, meant to be sipped and savored. The range is designated by a series of color-coded labels, and it has undergone a transformation in recent years. Founded in 1820 by Johnnie Walker, this is one of the iconic brands of Scotch whisky. The portfolio of blended Scotches is made up of expressions that range from affordable to super-premium, giving drinkers a choice while knowing that, whichever label they choose, it is going to be a quality product. As we've seen in our own attempts with Johnnie Walker, Scotch blending is an art form, and to get a drinkable (much less marketable) blend out of the myriad of whiskies available is a talent only a select few in this world can master. To be able to find that perfect blend, then repeat it in subsequent bottlings and remain consistent for years is even more of a challenge. With this perspective, a portfolio as diverse as that of the House of Walker is even more impressive. The thing that distinguishes one expression of Johnnie Walker from another is the color of the label. Each is a different blend of whiskies aged for a certain amount of time, with the most expensive being the oldest. This can make it a little confusing at the bar. It is not uncommon for a drinker to be surprised by his or her tab because of ordering one of the pricier Johnnie Walkers by mistake. If you like Red Label, you'll love Black Label. One step up in Johnnie Walker's color wheel makes a world of difference. Black Label is a complex blended Scotch that is surprisingly still affordable for the taste. It is the one that we would personally recommend for creating a great Scotch cocktail like a Rob Roy or Rusty Nail. It is also enjoyable on its own. Made of approximately 40 single malts and grain whiskies that are each aged at least 12 years, Black Label is a great introduction to the taste of Scotch because it has a nice balance of sweet and peat. It is an elegant Scotch at a great price and a reliable whisky that can easily become a regular in any bar. The name Johnnie Walker is one of the best known in the world of Scotch. The square bottle, colored labels distinguishing the blends, and the complex flavors have all combined over the years to make this Scotch one of the best selling in the world. The key to Johnnie Walker's success is consistent, beautifully mastered blends, and Black Label is a shining example of the art of blending fine whisky for a reasonable price. In 1820, John Walker began blending whiskies, and in 1909 his son Alexander brought the family business to a new level by relaunching an old recipe under a new, easier name: Black Label. Can you call a Scotch scrumptious? We think this one qualifies. It's as if Willy Wonka got into Scotch, adding bits of sweet, a touch of smoke, and a mouthwatering blend of indescribable flavors. 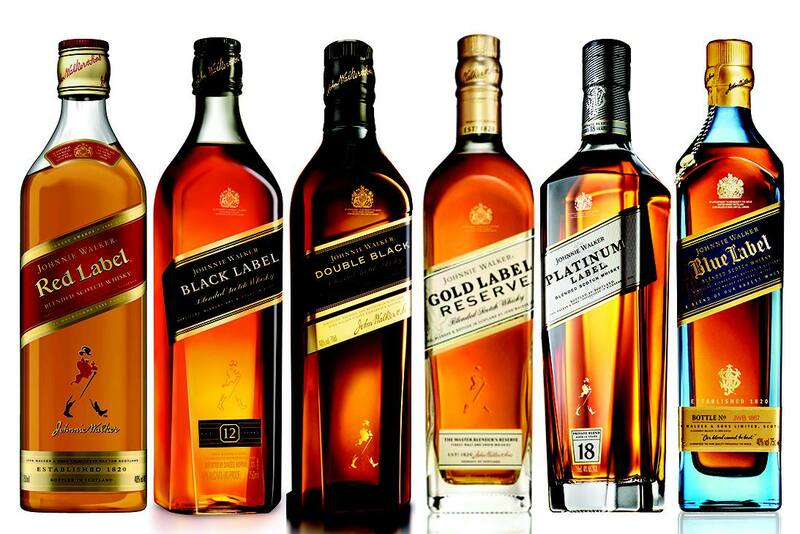 Johnnie Walker Black Label is the most complex of the portfolio and includes around 40 whiskies. Most are single malts, and a few of those are exclusively produced for this particular blend. The blended whiskies used represent the vast range of Scotch regions, from the mellow lowland malts to the robust island malts and the ember-like Islay malts. The problem many drinkers have with Scotch is that they can be too peaty (or smoky). It is the defining characteristic of this style of whisk,y and that is why a blended Scotch like Black Label also adds grain whiskies to the blend. This softens the peaty Scotch experience, rendering a drinkable and sweeter whiskey. For those who enjoy a balance of the two - sweet and peat - Black Label is a great place to start. This balance also lends itself wonderfully to the few great Scotch cocktails, like the classically simple Affinity. In the Robert Burns, an intriguing war between peat and anise takes place, and Johnnie Walker Black Label is one of the most fitting opponents of all Scotch whiskies. Each of the distillery characteristics known to Scotch come through in Black Label. The aroma is sweet and fruity with a touch of peat. This leads to a sultry palate of warm grain and oak with vanilla and butter notes. It finishes semi-dry and retains a balanced smoke for a period just long enough that the taste buds crave more. Originally known as "Walker's Old Highland Whisky"
Full-bodied and complex, Double Black remains attainable. What started as a limited edition expression in 2011 became a permanent fixture in Johnnie Walker's portfolio and a reason for Scotch lovers to celebrate. Similar to Black Label, but with a richer, more intense flavor, this is a masterpiece of blended Scotch. If you enjoyed the introduction of smoke in Black Label, Double Black is going to be the perfect next step in refining your Scotch palate. It is, again, a great whisky to mix into simple cocktails. If you're drinking it straight, do yourself a favor and add a little-distilled water to really open up its flavor profile. Johnnie Walker Double Black was originally a limited edition release blended Scotch whisky that delivers a complex, bold, and classically Johnnie Walker flavor profile that is sure to please. For those looking for a world-class whisky at a reasonable price point, look no further. Johnnie Walker Double Black is the answer. Johnnie Walker Double Black was created by Master Blender Jim Beveridge to complement the current Johnnie Walker range, and the result is a masterful creation. A blend of both naturally smoky aged whiskies and specially selected whiskies aged in deeply charred barrels, the nose offers rich aromas of peat smoke, vanilla, orange marmalade, and caramel. Johnnie Walker Double Black is rich and mouth-coating, a delicious banquet for the senses. On the palate, notes of Christmas fruitcake, plum pudding, orange zest, and vanilla emerge from underneath a smoky layer of peat, creating a memorable and delicious whisky. Johnnie Walker Double Black offers a surprisingly spry finish. Light fruit notes begin to emerge, think apple crisp, fresh Bartlett pears, vanilla scones, and candied ginger before giving way to cinnamon and orange notes. The finish is long, lingering and satisfying. This is simply a world-class whisky and essential to any well-stocked bar. Now everyone can get a taste of the Gold Label. The portfolio revamp was completed in 2014 with the highly-anticipated release of Gold Label Reserve. Available previously only in duty-free markets, it became readily available and is a permanent fixture in the brand's line. This expression is a blend of 15 whiskies, which Master Blender Jim Beveridge handpicks and which includes Clynelish Malt Whisky. It is a very easy drinker and a welcome addition to the Johnnie Walker family. Gold Label Reserve is sweet and smooth, beginning with an aroma marked with fruit, flowers, and thick caramel. The sweetness continues on the tongue and has undertones of vanilla and cream accented with a delicious honey. This Scotch finishes long and strong with a light smoke and sweet, woody fruits. It is a Scotch that anyone can enjoy. Try it in a Fields of the ​Gold cocktail. If you have the money, Platinum Label is a Scotch you won't want to miss. This is where the current Johnnie Walker portfolio begins to step into the realm of luxury Scotch, and it was a welcome new addition in 2013. If you enjoyed the Gold or Green Labels, be prepared to be blown away by Platinum Label. The art of blending whiskies is shown with perfection in this label, which has until now been reserved for private tastings and exclusive events. The doors have opened, and now we can all enjoy this full-flavored Scotch that is a blend of single malts and grain whiskies, each at least 18 years old. Master Blender Jim Beveridge, created this whisky from select casks of just 20-25 distilleries and created a beautiful sipping Scotch. Imagine a whisky with a little Speyside sweetness and a touch of Islay smoke and peat, add a little fruit and you have Platinum Label. Do not think about adding anything to this Scotch other than a splash of water or an ice ball for a really slow melt. It is spectacular on its own and deserves to be appreciated as a finely crafted liquid that, we daresay, rivals Blue Label. For its considerable age, it is also reasonably priced and worth every dollar. Do not accidentally order Blue Label at the bar; it will cost you. The pinnacle of the Johnnie Walker portfolio, Blue Label is that Scotch that many of us only get to taste on rare, usually very special occasions. It is a luxury, and there are few other drinks that can follow up a four- or five-star meal like a glass of Blue Label. It is beautiful, it is an experience, and it is one of the best spirits you will find. We have tried this and know it to be true: Johnnie Walker suggests that the best way to enjoy Blue Label is to "cool the palate with a glass of ice-cold spring water" then sip (not more than 1 1/2 ounces) from a snifter. Johnnie Walker is one of the most famous brands in the world of blended Scotch whiskies. Each marque has its own color designation, from red to black, to green and then gold. At the pinnacle of the Johnnie Walker line is the exceptionally well regarded Blue Label blended Scotch whisky. Each bottle of Johnnie Walker Blue Label comes in its own silk-lined box, with a certificate of authenticity and a unique serial number. Luxury, exclusivity, and quality are implied by the presentation, and the contents of this bottle do not disappoint. On the nose, Johnnie Walker Blue Label offers up a nosegay of floral notes, dried lavender, roses, and ranunculus predominate. Notes of leather, raisin, lemon peel, Seville orange, and pipe tobacco emerge with time. Johnnie Walker Blue Label is a rich, full-bodied, and mouth-coating whisky. Dried plum, tobacco, cedar wood shingles, and hints of toffee are at the forefront of this whisky. As it caresses the palate, orange marmalade, rose petal, and brown sugar flavors peek out from behind a curtain of soft smoke. On the finish, Johnnie Walker Blue Label delivers what every super-premium Scotch whisky should: complexity and elegance intertwined. Big smoke notes emerge to clear the earlier fruit notes off of the palate with more cedar and tea spice notes at the end. This is a long, lingering finish that true whisky enthusiasts will find immensely satisfying. Fans of Green Label may have to take a trip to get it. When the Johnnie Walker portfolio received its makeover in 2013, Green Label was phased out of the U.S. market. It will reportedly remain a focus in its most popular market, Taiwan. Green Label is a blend of just four malts selected "from the four corners of Scotland," each of which is at least 15 years old. Extremely smooth and often described as honeyed, it also has notes of dried fruits. The Scotch whiskies produced by Johnnie Walker are iconic in the world of blended whiskies. We had the opportunity to participate in an online tasting seminar with the Master Blender Andrew Ford. The experience opened our eyes to the different styles of whisky used to make these fantastic blends and left us with a deeper appreciation for the artistry of blending. Sampling each of the single malts that represent the different regions of Scotland was amazing. We started with a very light grain whisky and a sweet Lowland malt and worked our way through to the very smoky Island and Islay malts. When all tasting was done, it was our turn to blend. Our Scotch blends were far more successful than our attempt at creating a palatable Canadian whisky, although we don't know if you could get a really bad blend from the samples we had to work with. Of those we attempted, our blend of 2 parts each Speyside and Lowland malts with 1 part Islay malt quickly became a favorite. It had the sweet, fruity, and smoky elements in a proportion that we gravitate toward. In relative proximity to our single malt blend, Ford recommended we try a more common blended Scotch recipe. This uses 50% grain whisky with the rest made of a mix of sherry, Lowland and Islay malt blend. Did we get close to Johnnie Walker Black Label? Not in the least. With the samples given it would be impossible because around 40 whiskies make up that signature blend, and, of course, the Master Blender was not going to give up any of their Scotch recipes. It is amazing to think that these blenders can continually produce the same distinct characteristics using so many whiskies in batches of cask strength Scotch that average 250,000 liters at a time. Now that is an art form. While a number of the offerings from Johnnie Walker are best reserved for sipping straight, and all of them are enjoyable this way, there is no need to be afraid of mixing some of these whiskies into cocktails. We would stick to the Red, Black, and Double Black labels for mixed drinks. If you're feeling good about life, you may even consider the Gold or Platinum labels as both will make some of the best Scotch cocktails you are likely to have.